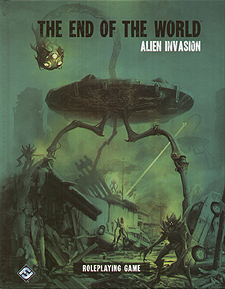 The End of the World is a series of roleplaying games unlike the traditional games you are used to. In The End of the world, you don't play a figure out of history or fantasy, you play yourself. It is the end of the world as we know it. We are not alone in the universe. Hostile visitors descend from the stars, their technology as inscrutable as their motives. They come with flying saucers and death drays to fight us in the streets. Ants the size of cars swarm entire continents. Reptilian shape-shifters infiltrate the highest echelons on international business and government. What can mere mortals do in the face of extraterrestrial annihilation? Five unique scenarios of the Apocalypse that each include locations, NPCs, and alien horrors.